Grainne is a multi- instrumentalist and singer from East Cavan. She has been playing music and singing since a young age and draws inspiration from the like of Paul Finn and Dolores Keane. Her achievements include All Ireland titles at Fleadh Ceoil an hEireann in Grupa Ceoil with CCÉ Ceolteoiri Drumlin (x2), Céilí band, Melodeon, duet and won Battle of the Bands at UCC tradfest. Grainne has performed a variety of sold out concerts at venues which include the Drogheda Arts Centre with the O’Connor’s, The Helix, Live on Air Fesitval and The National Concert Hall. She played a residency at ‘Raglan Road’, Orlando in 2015 and toured many parts of Europe playing Irish Music. 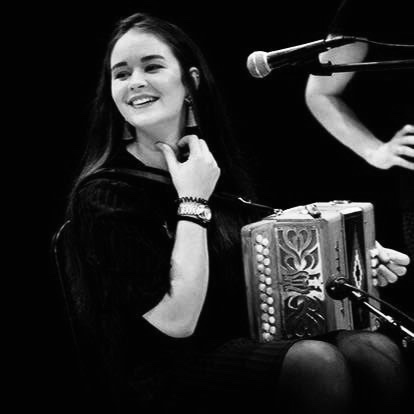 Grainne has supported bands and solosits which include Beoga, Goitse, Dublin City Ramblers, Chris Kavanagh, Breaking Trad, Martín O’Connor, Zoe Conway, Donal Lunny, The Full Set, and Mundy. Grainne is looking forward to joining ‘Murphy’s Celtic Legacy’.